Writing “The Barn Door” and “Lost Dog,” prequel stories set on July 4 and July 5, 1898, to my calendar mystery series, reminded me of a trip Mom, Dad, Dotty, our short-legged beagle mix, and I made one summer not long after they bought the first car I can remember our having: a used, white and light blue ’54 Chevy two-door. Later Dad discovered a short cut to our destination, the farm in Clarion County, PA, where my grandmother Willman grew up. But the first time we visited there for that Independence Day back in the fifties—before there even were interstates—we came in through Lamartine, a town of maybe forty households, a general store, a school and the Methodist church. (You won’t find it on any map because the name was later changed to Salem.) The tiny town stretched along a country crossroads, north and south, then east past Daddy’s aunt Maude and his cousin Walter Kurtz’s houses, and on down the hill between sloping fields planted in wheat. At the bottom of the hill, Daddy turned right onto a rough dusty road. As we drove between what Dad called the water meadow and the family’s wood lot, I sat up straight for the first view of the house across the pond. Built in 1877, white with black shutters, it had two windows upstairs and two down, balanced on either side of the front door, up a few steps from the yard. I loved the house when I first saw it and fretted restlessly in the back seat to get inside it even as the car bumped up the lane past the pond, past the house, past the garden and stopped by a decrepit corn crib. The substantial barn, built by my great grandfather Shirey in the Centennial year of 1876, stood farther up the hill on the right. By the time we went to family reunions at the farm, milkweed and slender scrub oaks, seven or eight feet tall, had over-grown the yard in front of the barn at the lowest level. But my uncle George Hickman kept the lane mowed up and around the barn to the big doors on the other side. Beams a square foot spanned the big space up there. Dad said they’d come from the property itself. No doubt the logs for the cabin where the family lived at first came from there, too. The year after the barn went up, my great grandfather Shirey, undoubtedly with the help of his neighbors, built the house around the cabin, then tore the cabin down, leaving a V-shaped house. We entered the house by way of the huge, square country kitchen ruled over by the white-haired dowager of the family, my grandmother Willman. She had as her minions my aunt Mary Hickman and her daughters, all more reserved with our part of the family than Uncle George, largely due to a feud over money the decade before. By the fifties, the situation had reached détente, mostly I think, because Mom wasn’t about to let old grudges deny her more or less free accommodations like those in the old house with half a dozen bedrooms, large and small. Later, I slept in a narrow bedroom just around from the stairs. Back when Dad was a kid, a maiden aunt had this room. She must have been a poor relation because the room was very spare, furnished with bed barely larger than a cot, an orange crate on end for a nightstand, and a chest of drawers. The room had two windows. One next to the orange crate that served as a nightstand overlooked the side yard and the privy. The other window on the far side of the bed looked out at the steep hill behind the house. On hot nights, the wind breathed in one window and out the other, making the little room pleasantly breezy and cool. I found some ancient novels from the 1920’s on the lower shelf of the orange crate, and inveterate reader that I already was, I tried them. They seemed quaint and a little dull. During that first summer visit to the farm, Daddy and I went for several walks. One day in particular stands out. Dad and I climbed the long, steep hill behind the house all the way to the top. There we found several graves overgrown by prickly bushes. Field stones marked the graves, by then, shallow depressions in the earth. The graves with stones only two or three feet apart made us sad as we knew babies and children were buried there. Dad said that these graves were probably from around the time his grandparents first settled in this part of Pennsylvania, back around 1875 or so, not all that long after the Civil War. As it turned out, the highlight of our first visit to the family farm, at least for me, was a watermelon my dad picked up. The afternoon we arrived, we went out again in the car right after lunch, this time with Uncle George, so he could direct us to an open-air market nearby. On that hot July afternoon, Dad wore khaki wash pants and a short-sleeved shirt with the deep oval of his white undershirt showing at the neck, and rings of sweat darkening the underarms. A straw hat hid his thin, dark hair. 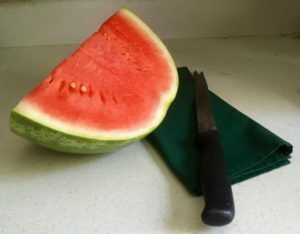 “Uh huh,” I said, though I didn’t really know what that thump of his fingers against the striped green watermelon meant. The clerk weighed the melon and Dad paid for it, twenty cents to the pound. There were lots of pounds. He hefted it up to his left shoulder and carried it over to the car. Though Dad was a short guy, only about five foot five, he’d trained himself when he surveyed the mountains of West Virginia for the CCC to stride exactly a yard every time his right foot hit the dirt. And so it was. On Independence Day we dined like hogs on Grandmother Willman’s Parker House rolls along with fried chicken, ham, meatloaf, deviled eggs, those weird gelatin salads that many of the women tried made back then, baked and green beans, the latter picked early that morning and cooked just with butter in a big pot. “These beans are delicious,” my mother said once she’d tried them. And that was really something since she gave few compliments, especially to Daddy’s women folk. After the ladies commenced to slice the pies and cakes, Dad went down to the spring house and fetched the melon up to the barn on his shoulder. Cold water slid around his wrist and dappled his shirt as he carried it to the picnic table outside the barn, its doors flung open wide to let light and air in to the other tables. Dad laid the melon down on the oilcloth, cut the melon in half lengthwise with a long-bladed knife. The two halves split open to reveal the pink meat and black, slippery seeds. Daddy cut the halves into quarters, then the quarters into wedges and slices. I spat the seeds out into the grass as I ate watermelon, sweet and ripe to the center, and so cold it made my teeth ache. In the evening, we snacked a little more, though not on the watermelon, long since devoured, its seeds scattered in the grass, its rind collected by my grown-women cousins in bowls and basins to pickle for next year’s picnic. Then we waddled to the cars and drove up the lane and out the country road, back to Lamartine to hear a fife and drum corps, just like they had back in the days of the American Revolution when western Pennsylvania was the frontier. After dark we watched fireworks out over the dewy hill, so close I smelled the gunpowder. Long after dark we drove through a countryside resounding with crickets and cicada, back to the farmhouse sheltered by the hillside. I fell asleep in the narrow bed in the narrow bedroom, not knowing how special in my memory of that day, my folks, and that melon would become, long after it was devoured and yes, the watermelon rind pickles too. 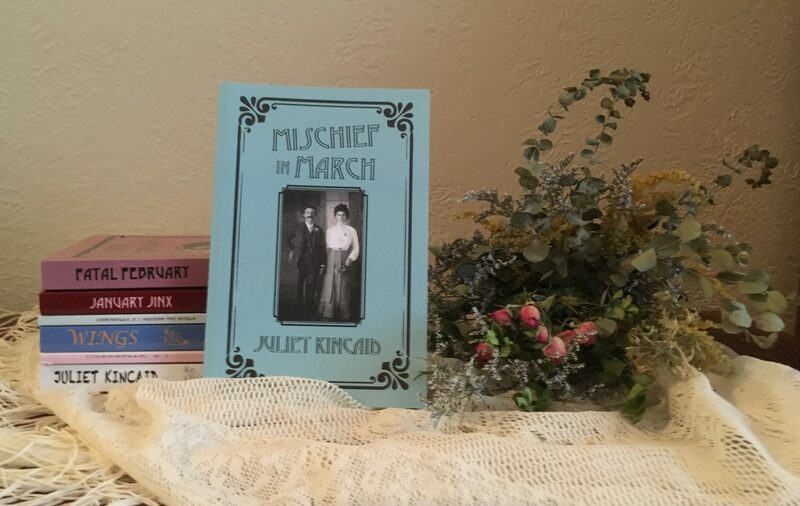 Juliet Kincaid writes the calendar historical mysteries and the Cinderella, P. I. mysteries for grown-ups. Stories and novels of both series are available as eBooks and trade paperbacks from Amazon.